Sustain BC is our largest program area, supported by three of BC’s major social impact funders. 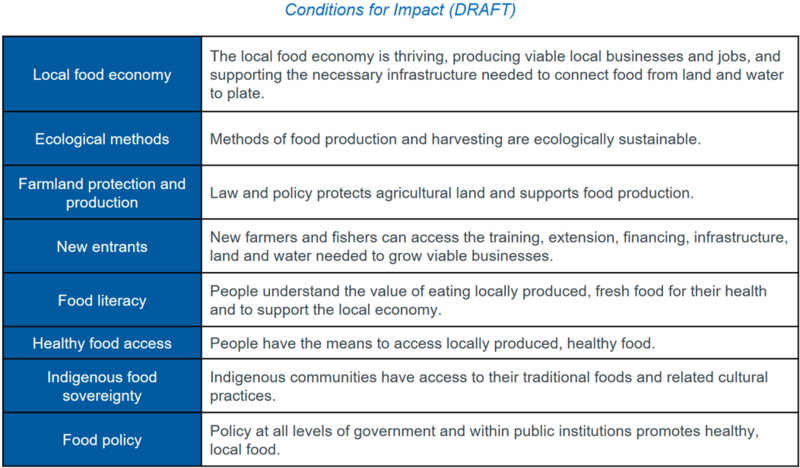 This project aims to foster sustainable food systems in BC at the provincial level, using a collective impact / multi-sectoral governance model for which the BCFSN serves as the backbone organization. What are the conditions we want for a local and sustainable food system? Results from the first two years the Sustain BC initiative includes the development of a shared measurement framework, identification of eight winning conditions for impact and several related impact measures. The conditions for impact are defined as a set of circumstances that, when brought together, are likely to contribute to achieving the results and ambitious goal. The conditions for impact are our theories on how we can work towards the results. Notice that this definition is steeped in uncertainty: they are conditions likely to contribute to achieving the results. The conditions for impact are things we believe we can achieve and we believe will contribute to making a larger difference, but we can’t make guarantees nor should we. Here are the DRAFT conditions for impact. Sustain BC is governed by a Leadership Council – see Terms of Reference linked here: Sustain BC Leadership Council Terms of Reference – February 15 2018. Two teams have been convened since inception of the program, Farmland Production and Protection and New Entrants. We gratefully acknowledge the funding support of the Real Estate Foundation, Vancity enviroFund, and the Vancouver Foundation.